Dozens of different hardwood species act as hosts for this insect; Birch (Betula), Lilac (Syringa), Crabapple (Malus), and Cherry (Prunus) act as some of the more common hosts in the Northeast. The most notable aspect of this pest is the unsightly silken web that it produces. Many times, there are many of these webs per tree. These webs are started near the tips of the branches and gradually are extended down the branch towards the trunk. The caterpillars cover and skeletonize the foliage as they proceed. The adult moths are white and are rarely noticed or recognized except to the trained eye. Larvae are pale yellow and hairy. Injury is mostly aesthetic. Adults are active from May into July and females lay small clusters of eggs on the undersides of the foliage. 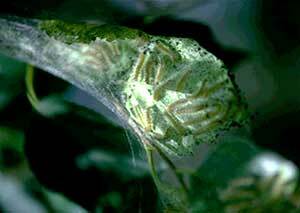 The newly hatched larvae appear by mid-July and begin to form silken webs around the foliage. 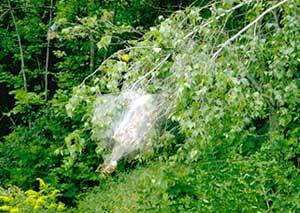 Many caterpillars will occupy one tent or web. Larvae feed within the protection of the silken web and expand it downward toward the trunk of the tree throughout July and much of August. Pupation occurs on the ground or in the leaf litter in cocoons. GDD for the larval stage is 1266-1795. 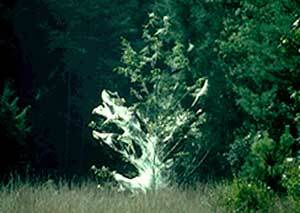 Small trees may be completely covered with silk and totally defoliated. However, injury happens late in the growing season, and if the tree is not under previous stress, most of the injury should be aesthetic. Newly forming webs (mid-July) can be mechanically removed or treated. Bacillus thuringiensis (B.t.) is effective on the younger larvae. Never use fire to burn webs out of the trees. Fire can be extremely detrimental to the bark of the host plant and has the potential to cause much greater long-term injury than the fall webworm ever could.